Kinek.com update, now with more US shipping address! After a busy few weeks, we are finally ready to unveil a major update to our sister-site, Kinek.com. We’ve made a lot of changes to the look and feel, and also added quite a bit of content too. One thing we’ve added (we’re actually a little surprised we didn’t think to add it sooner) on the home page is a quick reference to our border KinekPoints that so many Canadians have come to love. 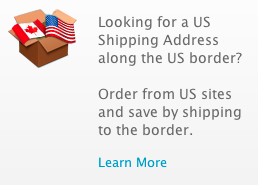 Clicking it will take you to a section of our “Why” page that describes all the ins-and-outs of how our network of border KinekPoints can act as your US shipping address. At the bottom of the “Why” page, we also describe how our network of nearly 1,000 KinekPoints throughout the US can give you the ability to receive online orders while on vacation or business travel in the States. We’ve also added a section in the FAQ’s that talks about our border locations. Another major update to the site is a complete overhaul of the mapping function. We’ve made a number of little tweaks that will make it easier for you to find a convenient KinekPoint to have your online or catalogue orders shipped to. Want to see something cool? Try zooming out to view all of the US in our new map, give it a few seconds and you’ll see the map absolutely covered with markers representing our locations.